Free summer movie season starts tonight in Central Park with a screening of And God Created Woman, presented by the Francophile Films on the Green series. 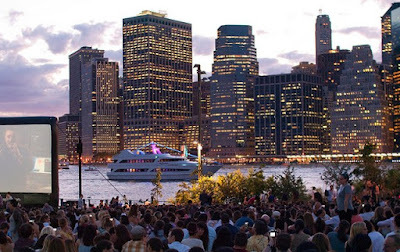 New Yorkers have a cornucopia of gratis outdoor cinema to choose from during the next three months, and to help sort it out we're putting together this compendium of all the free outdoor movie screenings in NYC this summer, from Bayside to Bryant Park. This year's lineup is incredibly varied with something for everyone, whether you're stoked for Spongebob or fascinated by 1980s "ball culture." These screenings aren't ticketed, but many of them fill up fast, so be sure to show up early to get the best spot. Indulge your inner francophile with French film And God Created Woman (Cedar Hill at 8:30 pm) or catch '80s blockbusters and a pre-movie DJ set (between Sheep Meadow and 72nd Street Cross Drive) at Central Park's popular summer movie series. The music begins at 6:30 p.m. and goes until opening credits at 8 p.m.
Keep up with Films on the Green at Washington Square Park in Greenwich Village. Show up a little before 8:30 p.m. to snag a good spot. Hang out by the water at Crochern Park in Bayside, Queens for this new children's classic that adults can thoroughly enjoy. The screening starts at 8:30 p.m.
Riverside Park will start off by hosting Goha and Queen to Play as part of Films on the Green. Both movies begin at 8:30 p.m at Pier 1. The rest of the lineup will take place at 8 p.m. on the 72nd Street Track and Lawn. Head over to Betsy Head Park at Strauss and Durmont in Brownsville for a music performance by DJ Fulano at 7 pm followed by the newest version of Annie at 9 pm. Randall's Island Park is showing three outdoor movies this season including the pinnacle of summertime terror, Jaws. The screenings begin at 7:30 pm. Picnics are encouraged. Like all movies featured in this year's Films on the Green, both draw from the Mediterranean as inspiration. All movies are in French with English subtitles and begin at 8:30 pm. Along with the movie, there will also be music performances by the Bullitts and DJ Spinna. Jeymes Samuel of the Bullitts is also the director of They Die By Dawn and presents his music set as a prelude to the film so make sure to arrive at 7 p.m. to catch both. In keeping with tradition, Bryant Park is hosting an outdoor movie every Monday evening from late June to the end of August. The lawn opens at 5 p.m. for blanket turf wars picnics, and the films begin at sunset. If you don't have someone on site to grab lawn space at the stroke of 5, you can pretty much forget it. Stop by the Bandshell at 7:30 p.m. to experience a night of film in one of the best parks of the city. Documentary Paris is Burning explores the '80s Harlem drag balls and The Son of Sheik will be accompanied by a live orchestra playing the score. Beer and wine will also be available for purchase. Check out these kid-friendly screenings at Rockaway Beach, hosted by their Movie Nights in the Rockaways series. Shows begin at dusk (or around 8 p.m.), but be sure to give yourself ampletransportation time. Coney Island will be hosting Flicks on the Beach on Mondays all through July and August. A giant inflatable screen will be set up at 1001 Boardwalk West turning the beach into a walk up theater. Bring your swimsuit and made a day of it. The show starts at 7:30 p.m. This year's SummerScreen roster at McCarren Park hits all the classic summer high points, but if your favorite movie isn't on the list, cast your ballot for the audience pick. There will also be food and live music starting at 6 p.m. Film begins at dusk. This summer Hudson River Park is alternating between "big hit" Wednesdays and family friendly Fridays(note: they are two different venues). Movies start around 8.30 pm. Be sure to grab a bag of thefree popcorn before it runs out. Watch a movie on the flight deck at the Intrepid Musuem. Each screening will be introduced by a special guest, including Jeffrey Kluger, co-author of the book Apollo 13. The event begins at sunset, but free tickets will be distributed on a first come first serve basis, so arrive early. Brooklyn Bridge Park is the host of this year's Movies With A View. Music kicks off the evening at 6 p.m. followed by the movie at sunset. There will also be various concessions for sale and photo contests with prizes so you can win yourself a souvenir. Anyone in the mood for Cuban culture should be in the Bronx on July 12th, where live music will accompany a documentary on the life of Celia Cruz. The show kicks off at 7 p.m. as a part of the City Parks Foundation's SummerStage series. SummerStage continues with Pete Rock and a look into the life of hip-hop legend Nas. Get there by 7 p.m. Films on the Green wraps up the last two weeks of July at 8:30 pm in Transmitter Park. Carl Schurz Park will be screening two movies this summer in the basketball court at 8:30 p.m. There will aptly be free snow cones at Frozen and popcorn at both movies while supplies last. There's no doubt many of your favorite artists can credit their early success to Stretch and Bobbito, whose radio show helped introduce Jay-Z, Biggie, Nas, Fat Joe, the Fugees and so many more to the world. Their 25th anniversary celebration will kick off at 5 p.m., with DJ sets and a screening of their documentary. This list will be updated until every last free outdoor movie on earth is obsessively compiled and sorted. And if you'd prefer to watch your free movies drink-in-hand, Canal Bar and Café Habana have you covered. It's also worth noting that Rooftop Films has an amazing list this year, but only a select few screenings are free. Tickets are 15 dollars, and can be bought on their website.